Welcome Connecticut Off Road Enthusiasts Coalition! We are happy to announce that the Connecticut Off Road Enthusiasts Coalition (or COREC) RideTrails.org site has gone live! 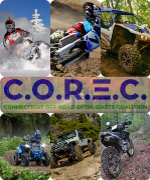 COREC is the OHV Association for the State of Connecticut. COREC is a non profit organization dedicated to lobbying and petitioning the politicians of Connecticut to designate land exclusively for use by it’s off road community. COREC is the second State Association using RideTrails to support their web operations and uses the newly-designed State Association template. Like other associations, COREC is using MemberPress to manage access to members-only content on their website, such as their user Forum. Visit their site at https://ctohvaccess.ridetrails.org/ today! Previous Post: Old Colony Trailblazers is Now Live! Next Post: Welcome Trail Riders Enthusiast Council!